There's nothing lovelier than visiting and falling head over heels at very first sight. Never was this more pronounced than when I first stayed in New York this June; I remember being captivated from the very get go. I loved returning there for the end of my USA travels, and succeeding in adding a few more favourites to my list of must-sees in this incredible city. June in New York is hot; intensely so. Thankfully I was prepared for this to be the case, but if I were to book another trip I'd go for a cooler month (autumn being my preference). I love Airbnb; when I lived abroad we stayed in them for a number of our trips and I've been a fan ever since. I prefer them to hotels because the locations and prices tend to be amazing; however, this trip we stayed in a hotel after Googling our chosen Airbnb's address and finding it was in a seriously rough area... Long story short: it pays to really do your research. Compared with London, NYC felt surprisingly compact. Many of the landmarks and spots on my travel wishlist were within walking distance from one another, so it meant that I was able to tick off a few things on the same outing... But the subway is a help for longer treks. For my first visit and part of my second, I went for the Chelsea Inn, a small hotel with an incredible midtown location that was offering deals while it underwent refurbishments. The hallways had yet to be re-done, but the rooms themselves were great. It was walking distance from Union Square (which had a fab market on Saturday and Wednesday) and the Empire State was visible from just down the block. My first stay was definitely better than the second as when I returned in August I was given a room on the street side of the hotel, which was incredibly noisy, especially at about 6 am... not ideal for someone who is jetlagged! I would contact the hotel directly to ask if you can have a room on the rear side of the hotel, which overlooks a yard and is much quieter. I also spent a couple of nights in the Heritage Hotel New York, which was great value but far less modern in appearance. Its location was also brilliant as it was also in midtown, just a stone's throw from the Flatiron building, but I still preferred the look and feel of the Chelsea Inn. I'm no longer much of a shopper, so my time was spent visiting as many of the landmarks and must-sees I had been eager to visit. A huge and stunning space, this marble building made me seriously consider postgrad study for purely archaeological reasons. I wish I'd spent more time wandering around as it was pretty spectacular. Another place I wish I'd had more time for! It was filled to the brim with great exhibitions and like many museums, the entry fee was a suggested donation. 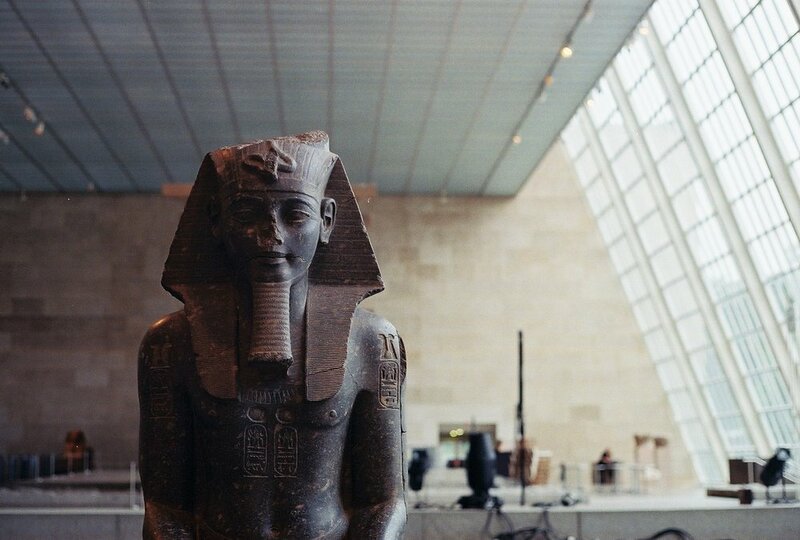 In particular I'd recommend seeing the Temple of Dendur (it features in the background of the paprikash scene in When Harry Met Sally). Great for foodies with an empty stomach, Chelsea Market is said to feature some of the best food in NYC. Eateries from all over the world rub shoulders with one another but even for those that are just wanting to have a nose around (like I was), it was a sight to see. Just nearby is the Highline, a former freight train track that has been turned into a little park above ground level. If you're a hipster, you're going to love it. While many choose to go up the Empire State Building, I chose to go up to the Top of the Rock as I knew the views were amazing, with the added benefit of being to see the Empire State too. (The top photo of this post is one that I took from the observatory there.) It features three levels; the lowest is mostly indoors; the second is outside but with large transparent barriers to shield from the wind; the third is completely exposed (and for me, a bit scary... not the one for a windy day!) In the Rockefeller's basement are a variety of eateries if you are after some convenient lunch options and its plaza is recognisable from Elf and 30 Rock. I loved it. During my second stay in NYC, I met up with the incomparably lovely Coline from Conflicted Beauty for a little wander around Brooklyn and it made me regret not having come sooner! Now very much in the midst of a gentrification, this hipster paradise was knee deep in the coolest stores, restaurants and bars in town. Pop into any of the shops in the area around Bedford Avenue as even if you are just there to browse, there are some amazing indie places to be found! A great recommendation from my bestie, this place offers thin crust pizzas that are at a great price and fab quality. Apparently this place is adored by NYC locals, so you know it must be fab. I went to Dough three times in seven days and I regret nothing. The most delicious doughnuts I've ever tried, they are know for the Dulce de Leche flavour and it was a dream. Gorgeous as a pick me up treat after a proper New York downpour. Available in a few locations, this place was recommended by Coline for its variety of delicious dairy and vegan ice creams. I went for the vegan chocolate chip and peanut butter cookie dough flavours, which were both divine. And there you have it... The This Last Moment guide to New York city. I know I will be back there as soon as life allows, so if you have any NYC recommendations, please come to the comments!